Although compression can be used as an obvious effect, it's more likely to be used as a subtle tool. One of the reasons guitarists may be wary of compressors is that what they do isn't always that obvious. Take the compression away, however, and it will be missed. The simplest explanation of a compressor is that it's an automatic volume control that turns down your signal when it exceeds a predetermined threshold, attenuating or squashing signal peaks. Basically, it makes the quieter parts of an audio signal louder and the louder parts quieter: in effect, it's narrowing the dynamic range of a signal and delivering a more consistent overall loudness. What are the different knobs for? There's usually a volume/level knob, which sets the output level of the pedal; and a knob (often marked sustain, sensitivity or gain reduction) that increases the amount of compression. In addition, you may get an attack knob which determines how fast the compressor kicks in, letting more of the transient through and influencing the note 'snap'. There may also be a tone control, as compression can be perceived to dull the sound. Do I have to compress the whole of my signal? There's a technique known as parallel compression, where some compressed signal is mixed with the dry signal. This allows you to retain some of the attack and dynamics of your original signal, but still have some of the benefits of compression. 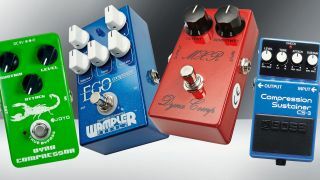 Pedals such as the Barber Tone Press and the Wampler Ego will let you do this. Another technique is multi-band compression, where you compress separate frequency bands to a different degree - useful if, for example, you want to keep only the bottom end of your signal really tight. This type of compression is quite rare in stompboxes, but EBS incorporates it into the MultiComp. So, how would that help my guitar sound? Well, it can smooth, thicken and tighten your sound by evening out the volume differences between the notes or chord strikes. If you are less than consistent with your pick strikes, a compressor can come to your aid, delivering more constant dynamics: great for chord work or playing tight, highly rhythmic funk. Similarly, in country picking where there are likely to be lots of notes played quickly, including plenty of hammer-ons and pull-offs, a compressor will make sure they are all weighted equally. In that context, there's another thing that a compressor can do as it works on the transient (front edge) of the note to alter its envelope - this is often referred to as giving some snap, pop or click to a note. Another aspect, some may say the most important, of a compressor's action is that it can increase sustain, and can do it while still maintaining a clean sound rather than using overdrive/ distortion. As your note is fading, the compressor is working to keep the level up so your note lasts longer, benefiting slide players or anyone that wants clean notes to ring on. That's not to say it's just for clean sounds: a compressor works fine with overdriven amps, and can be used as a booster to drive your amp into more dirt.